Do you take children on actual sleepovers and travel adventures? Do you have print books? What do you mean by interactive features on the iPad? What is the difference between interactive, multi-media and animation? On most pages, the reader will be prompted to push or drag an object. When the reader does that, the page becomes animated – a game appears, objects get bigger or smaller, a glossary appears, a fun fact appears. For example, in “A Soccer (or Football) Sleepover in Brazil,” the parrot will dance back and forth to samba music when pushed. Interactivity, multi-media and animation are separate but linked features. Interactive elements allow the reader to engage with the animation by choice. For example, on any given page, children can push a word and see the definition or continue reading the story and return to the glossary at another time. Multi-media can include video, image, illustration, text, narration, sound, music, photographs. We design our content to ensure we choose the best type of media which suits our content. Animation is a tool in successful interactive and multi-media design. How do we use your interactive and multi-media books? The stories have the option of reading by yourself or with narration. We suggest that, at first, to let children discover the fun and exciting interactive features, rather than guide them. How do you design your stories? We have based our design, child-friendly features and other components of digital reading off Sesame Street, Sesame Workshop’s 2012 Best Practices Guide for the Touch Tablet. This guide, based on 40 years of children’s media testing, is available at (http://www.sesameworkshop.org/assets/1191/src/Best%20Practices%20Document%2011-26-12.pdf). What kind of tools do your stories have? Index: On the top right hand corner is the index, allowing the reader to turn the narration on/off and move from one page to another. The reader has three options – read by myself, read to me, and read to me without highlights. Narration: The story is fully narrated, with lines of text that highlight as the narrator reads. In the index section the reader has the option of turning the narration on or off. All animation is triggered to begin after a sufficient time has passed for a reader to read the story independently. So don’t turn the page too soon or you might miss the fun animation! We have designed it this way as not to distract from the reading. Animation and Fun Features: On pages with maps, readers can be prompted to drag the plane to the correct geographical location. There are three wrong choices. Interactive and Animation for Learning Vocabulary and Pronunciation: OUr storeis include pages which isolate words and terms that sound alike.. The reader can tap on the word to hear the pronunciation and subtle difference. Fun Games: The reader is prompted to help the characters repack their bag for a Sleepover. This is mean to be a fun game. What items go back in the backpack? Readers can drag the items into either backpack. Some items will not go into the backpacks – these are items that would not be needed or that one would not pack to take on a trip. On-demand glossary. We have provided a glossary for the story. In the Apple App and iBooks version of the story, readers can push on certain words to see/hear the definition. In particular, for the app, glossary words will be in blue. The reader can push on the glossary and the word’s definition and pronunciation appears at the bottom. How do we contact you regarding the Activity Boxes? We want you and your child to be pleased with your purchase and enjoy your Global Sleepover journey. Please contact us with any concerns at sales@globalsleepover.com or +1 347 762 1081. In some cases, we charge a nominal shipping fee. From time-to-time we offer promotions offering free shipping. Please contact us if you are dissatisfied with the product in any way. We will do our best to alleviate your concerns. After that, if you are still unsatisfied with your purchase, we will provide a refund. Please note refunds may be partial if materials in box have been used. How soon will I receive my order after placing it? How does my child use his/her Activity Box? Each Country Gift Box comes with an instruction sheet. A child is guided through the Box so he/she can learn about the country, play games and activities and then write a story about the country. You can learn more about how our boxes work here. What countries do you have Activity Boxes for? At the moment, our Activity Boxes take children on journeys to countries and locations such as Rwanda, Italy, Brazil, India, Antarctica, Italy, Christmas Markets in Vienna and a Spanish Language Box about Brazil! From time-to-time we offer special one-time boxes such as an Olympics Box in Summer 2016. What subscription package do you offer? At the moment, we are offering a 3- month and 6-month subscription package. 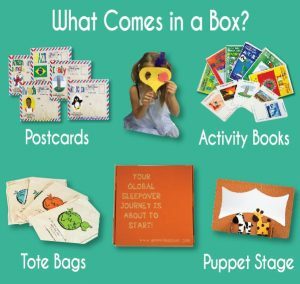 What items are included in each Activity Box? Each box comes with a full array of games, activities and items, all high-quality, arts-based and creative games and activities, storytelling tools and fun information about different countries in the world. 1. A canvas drawstring backpack tote bag for all the items in the box. Children can take the tote bag anywhere with them! Bag is 11.81 inches wide and 17.7 inches high. 2. A cardboard Puppet Stage with cut out paper puppets and popsicle sticks for the puppets. Children can use their creativity and have a puppet show anywhere! Stage is 10 inches wide and 16 inches high. 3. A 16-page Travel Journal with a set of Crayola crayons. Contains coloring pages, journal pages, country information, tips on how to have a world adventure birthday party, a letter from a new friend, and games/activities to teach global social awareness. 4. A 4-page fully bound Board Book where a child can write their own story! Board books are thicker pages and keep in better shape. 4.72 inches wide and 7 inches high. 6. A postcard a child can send to anyone and share about his/her Global Sleepover journey! What is the recommended age range for your Activity Boxes? We have designed the box for children ages 4-8. Children ages 4-5 may require help from an adult while older children, even as old as 10 years old, can use the Activity Box without assistance. How big are your Activity Boxes and how much do they weigh? On average, each box weighs approximately 1 pound and 12 ounces. Where do you get your content from? Who develops your content? Our products, programming and workshops are created and designed using Global Sleepover’s Three E Methodology. The Three E Methodology is our guiding principle which ensures an educational, entertaining and engaging experience in all our products and services. This approach has been tested and developed over 5 years and with over 50 schools in 7 countries. We continue to test, refine and improve this methodology. Research, data-based analysis, academic and theoretical assessments are critical to effectively teach literacy and global competencies and to implement project-based learning. For this reason, our research, data analysis and thought-leadership is lead by American University’s Intercultural and International Communications Program at the School of International Service in Washington, DC. Our stories, content and products are developed with continuous testing, research and teacher/student feedback. We incorporate monitoring, evaluation, assessment, teacher/student feedback and recommendations into all stages of our work. Participation and project based learning has a direct link to increased academic achievement. The Global Sleepover builds project and challenge based exercises through storytelling, art, creativity and imagination. Reinvesting in Arts Education: Winning America’s Future Through Creative Schools, a 2011 report by President Obama’s Committee on the Arts and Humanities, finds an undeniable positive correlation between learning of the arts and increased performance in academic subjects such as mathematics and reading. Challenge Based Learning provides for a process that places all learners in charge and responsible for the learning, a focus on global ideas with local challenges and solutions and purposeful use of technology. This participatory approach is also the driving rationale behind our curriculum. Our stories, educational products, games and activities align with National Common Core and International Baccalaureate Primary Years Programme Standards. Global competency, global citizenship, international education and 21st century skills are interchangeable terms. These skills empower children with the skills they need to engage in tomorrow’s global world. With these skills, they will be better prepared to address issues of global, social, and environmental concern, work collaboratively with individuals from different cultures and countries, develop and utilize innovative and entrepreneurial skills, and develop civic, critical thinking, and communication literacy. According to Asia Society’s Preparing Our Youth to Engage the World Report by Veronica Boix-Mansilla and Tony Jackson, global competency is the capacity and disposition to understand and act on issues of global significance. To this we add learning outcomes and teaching goals such as social inclusion, the ability to recognize and act on global and local citizenship; can identify actions that promote empathy and tolerance; demonstrated teamwork and empathy skills by working together to achieve a common goal; and a developed sense of belonging, confidence and community. How to bring your Reading and Storytelling Programs to our school, literacy organization, library or other event. Contact us at bookings@globalsleepover.com. Our fees are negotiable, we even offer free programs. Ask us for more information! Our fees are negotiable, we even offer free programs. Ask us for more information! Do we have to use technology in the storytelling workshops? No. Our workshops are designed to incorporate technology as a tool in learning. Technology only enhances the learning but is not critical! Why the focus on global cultures? o you come to us or can we come to you?